Rogue Gym Chalk is made from the same magnesium carbonate formula that rock climbers trust when their lives depend on a firm grip. In the weight room, sweaty palms can be no less perilous, so we’ve selected a performance chalk that consistently absorbs moisture without dissolving or caking on contact. We’ve also packaged eight blocks of chalk in one convenient, cost-efficient package for months of reliable use. Simple as it may seem, not all gym chalks are made the same, and they’re certainly not interchangeable. 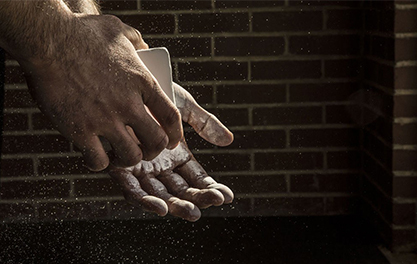 Rogue Gym Chalk utilizes magnesium carbonate—a solid, inorganic mineral that is uniquely insoluble in water. This means the chalk won’t dissolve as you sweat. Instead, moisture is quickly absorbed, your grip is maintained, and the risk of dangerous slipping is greatly reduced. 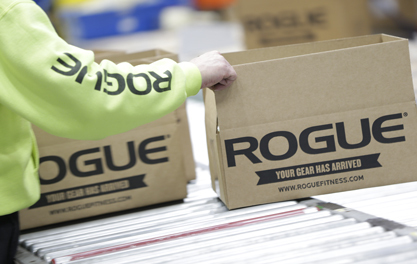 One box of Rogue Gym Chalk includes (8) 2oz blocks, enough to last for months of daily use. 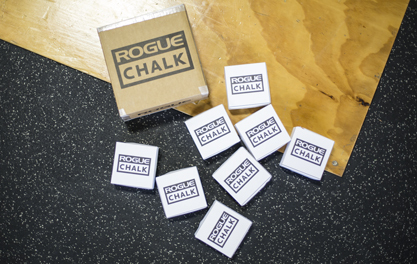 Rogue Gym Chalk is rated 4.8 out of 5 by 19. Rated 4 out of 5 by Coach Isaac from Awesome value, mediocre chalk blocks Two part review: 1. To clarify for anyone buying, the $11.99 block of chalk that LOOKS like it has a single block inside, actually has 6 blocks of chalk. We have about 80-100 clients walk through our gym door every day, most of whom are addicted to chalk, and the $55 pack takes us about 2 years to go through. It's a lot of chalk, for very, VERY cheap. 2. It is not amazing chalk. The blocks are very brittle and will not stay intact for very long, meaning you will need to apply it as powder. Powder tends to make a mess. Four star review because I can't justify paying 10x more for chalk just because people want a solid pressed block. Thanks for the cheap alternative Rogue! Always a fan. Rated 5 out of 5 by briney11 from It's chalk alright This is a really good quality chalk. I am liking how the blocks don't break apart when I rub it on my hands. Rated 4 out of 5 by Josh B from Chalky Bought this for my new home gym set-up. Lots of chalk for the price. This chalk is a finer chalk than I have used in the past and the blocks themselves are more brittle especially when you are rubbing the block itself onto your hands. I love the coverage you get from how fine the chalk is but I have noticed that when I am chalking up during a workout and my hands are sweaty it tends to "cake" more easily than what I have used in the past. All in all, I love the chalk and you get plenty for the money. Rated 5 out of 5 by Ka_stetics from A LOT OF CHALK! Was not expecting to get this much chalk! So i'm a happy camper! Rated 5 out of 5 by stilettostiletto from Unbeatable value You get a LOT of chalk for very little money. And I haven't had any of the issues some of the less happy reviewers had with it - doesn't get "gooey" on my hands and I sweat A LOT when I lift. I also haven't had issues with the blocks breaking apart and becoming powder. Overall, It does what it should perfectly - provides a nice grip for those heavy sets. Great product at a stellar value! Rated 5 out of 5 by Jeremey from Chalk UP! Grips very well and will not cake up when your hand get sweaty. Rated 5 out of 5 by LouIe from Lots of chalk! I just got my shipment of chalk.Wow!I didn't realize how much chalk I was getting.Not that I'm complaining.And the value,I bought a set of chalk balls (not great,first time I bought them and the last) for basically the same price.I'll be buying more equipment in the future you can't beat the price and shipping is great. Rated 5 out of 5 by JoeM90 from Stellar Value! It's lifting chalk, it does exactly what you expect it to do. What makes this an amazing product is the price! So much chalk for a very low price.